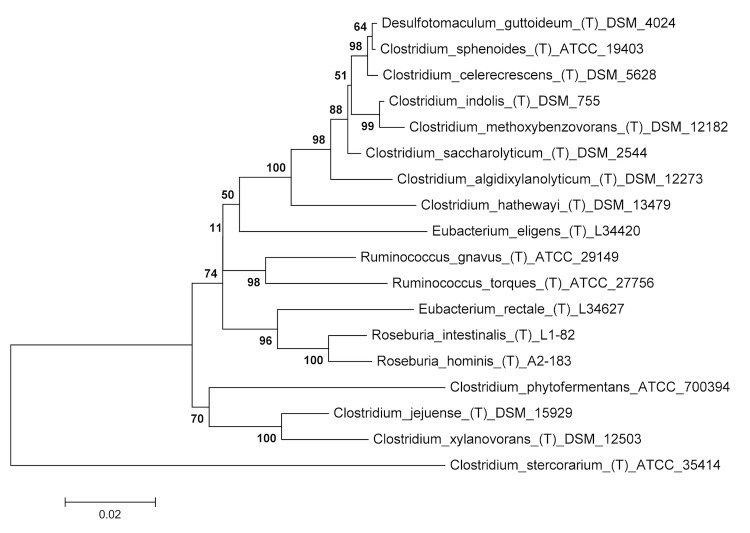 Phylogenetic tree based on 16S rRNA gene sequences highlighting the position of Clostridium indolis relative to other type strains (T) within the Lachnospiraceae. The strains and their corresponding NCBI accession numbers (and, when applicable, draft sequence coordinates) for 16S rRNA genes are: Desulfotomaculum guttoideum strain DSM 4024T, Y11568; C. sphenoides ATCC 19403T, AB075772; C. celerecrescens DSM 5628T, X71848; C. indolis DSM 755T, Pending release by JGI: 1620643-1622056; C. methoxybenzovorans SR3, AF067965; C. saccharolyticum WM1T, NC_014376:18567-20085; C. algidixylanolyticum SPL73T, AF092549; C. hathewayi DSM 13479T, ADLN00000000: 202-1639; Eubacterium eligens L34420 T, L34420; Ruminococcus gnavus ATCC 29149T, X94967; R. torques ATCC 27756T, L76604; E. rectale L34627T; Roseburia intestinalis L1-82T, AJ312385; R. hominis A2-183T, AJ270482; C. jejuense HY-35-12T, AY494606; C. xylanovorans HESP1T, AF116920; C. phytofermentans ISDgT, CP000885: 15754-17276. The tree uses sequences aligned by MUSCLE, and was inferred using the Neighbor-Joining method . The optimal tree with the sum of branch lengths = 0.50791241 is shown. The percentage of replicate trees in which the associated taxa clustered together in the bootstrap test (500 replicates) are shown next to the branches . The tree is drawn to scale, with branch lengths in the same units as those of the evolutionary distances used to infer the phylogenetic tree. The evolutionary distances were computed using the Maximum Composite Likelihood method  and are in the units of the number of base substitutions per site. Evolutionary analyses were conducted in MEGA 5 . C. stercorarium ATCC 35414T, CP003992: 856992-858513 was used as an outgroup. C. indolis DSM 755T was cultivated anaerobically on GS2 medium as described elsewhere . DNA for sequencing was extracted using the DNA Isolation Bacterial Protocol available through the JGI (Web Site). The quality of DNA extracted was assessed by gel electrophoresis and NanoDrop (ThermoScientific, Wilmington, DE) according to the JGI recommendations, and the quantity was measured using the Quant-iTTM Picogreen assay kit (Invitrogen, Carlsbad, CA) as directed. The draft genome of C. indolis was generated at the DOE Joint genome Institute (JGI) using a hybrid of the Illumina and Pacific Biosciences (PacBio) technologies. An Illumina std shotgun library and long insert mate pair library was constructed and sequenced using the Illumina HiSeq 2000 platform . 16,165,490 reads totaling 2,424.8 Mb were generated from the std shotgun and 26,787,478 reads totaling 2,437.7 Mb were generated from the long insert mate pair library. A Pacbio SMRTbellTM library was constructed and sequenced on the PacBio RS platform. 99,448 raw PacBio reads yielded 118,743 adapter trimmed and quality filtered subreads totaling 330.2 Mb. All general aspects of library construction and sequencing performed at the JGI can be found at Web Site. All raw Illumina sequence data was passed through DUK, a filtering program developed at JGI, which removes known Illumina sequencing and library preparation artifacts . Filtered Illumina and PacBio reads were assembled using AllpathsLG (PrepareAllpathsInputs: PHRED 64=1 PLOIDY=1 FRAG COVERAGE=50 JUMP COVERAGE=25; RunAllpath- sLG: THREADS=8 RUN=std pairs TARGETS=standard VAPI WARN ONLY=True OVERWRITE=True) . The final draft assembly contained 1 contig in 1 scaffold. The total size of the genome is 6.4 Mb. The final assembly is based on 2,424.6 Mb of Illumina Std PE, 2,437.6 Mb of Illumina CLIP PE and 330.2 Mb of PacBio post filtered data, which provides an average 759.7× Illumina coverage and 51.6× PacBio coverage of the genome, respectively. Genes were identified using Prodigal , followed by a round of manual curation using GenePRIMP  for finished genomes and Draft genomes in fewer than 10 scaffolds. The predicted CDSs were translated and used to search the National Center for Biotechnology Information (NCBI) nonredundant database, UniProt, TIGRFam, Pfam, KEGG, COG, and InterPro databases. The tRNAScanSE tool  was used to find tRNA genes, whereas ribosomal RNA genes were found by searches against models of the ribosomal RNA genes built from SILVA . Other non–coding RNAs such as the RNA components of the protein secretion complex and the RNase P were identified by searching the genome for the corresponding Rfam profiles using INFERNAL . Additional gene prediction analysis and manual functional annotation was performed within the Integrated Microbial Genomes (IMG) platform  developed by the Joint Genome Institute, Walnut Creek, CA, USA . Information in the tables below reflects the gene information in the JGI annotation on the IMG website . b) Also includes 170 pseudogenes. Plant biomass is a complex composite of fibrils and sheets of cellulose, hemicellulose, waxes, pectin, proteins, and lignin. Bacteria from soil and the gut generally possess a variety of genes to degrade and transport the diversity of substrates encountered in these plant-rich environments. The genome of C. indolis includes 910 genes (17.65% of total protein coding genes) in this COG group including glycoside hydrolases with the potential to degrade complex carbohydrates including starch, cellulose, and chitin (Table 6), as well as an abundance of carbohydrate transporters (Figure 2). Almost 8% of the protein-coding genes in the genome of C. indolis were found to be associated with carbohydrate transport, represented by two main strategies. ABC (ATP binding cassette) transporters tend to carry oligosaccharides, and have less affinity for hexoses [43,44], while PTS (phosphotransferase system) transporters carry many different mono- and disaccharides, especially hexoses . PTS systems provide a means of regulation via catabolite repression , and are thought to enable bacteria living in carbohydrate-limited environments to more efficiently utilize and compete for substrates . Both C. indolis and its near relatives are more highly enriched in ABC than PTS transporters (Fig 2), however nearly a third of C. indolis and C. saccharolyticum transporters are PTS genes, suggesting a preference for hexoses, as well as an adaptation to more marginal environments. 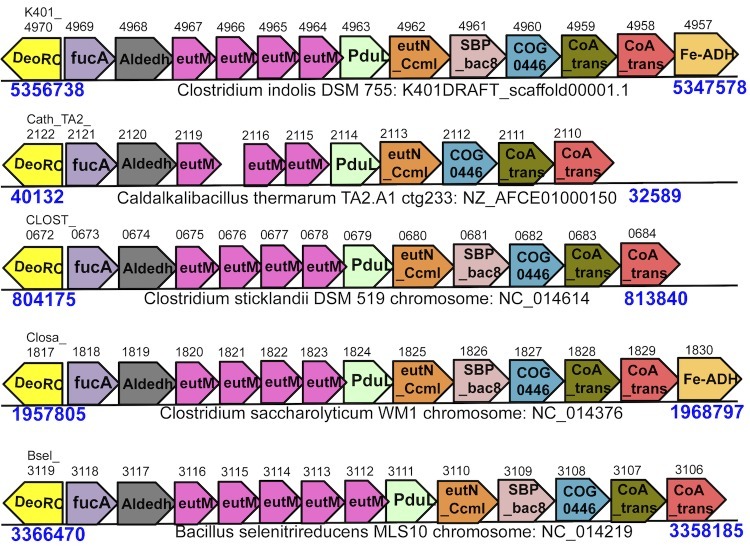 C. indolis also possesses ten genes associated with all three components of the TRAP-type C4-dicarboxylate transport system, which transports C4-dicarboxylates such as formate, succinate, and malate , as well as six putative malate dehydrogenases and two putative succinate dehydrogenases suggesting that C. indolis may have the potential to utilize both of these short chain fatty acids. The C. indolis genome contains genes associated with bacterial microcompartment shell proteins. Bacterial microcompartments (BMCs) are proteinaceous organelles involved in the metabolism of ethanolamine, 1,2-propanediol, and possibly other metabolites (Rev in [55-57]). BMCs are often encoded by a single operon or contiguous stretch of DNA. The different metabolic types of BMCs can be distinguished by a key enzyme (e.g., ethanolamine lyase and propanediol dehydratase) related to its metabolic function. While the other associated genes in the operon can vary, they frequently include an alcohol dehydrogenase, an aldehyde dehydrogenase, an aldolase and an oxidoreductase. Rainey FA. Family V. Lachnospiraceae fam. nov. In: De Vos P, Garrity G, Jones D, Krieg NR, Ludwig W, Rainey FA, Schleifer KH, Whitman WB (eds), Bergey's Manual of Systematic Bacteriology, Second Edition, Volume 3, Springer-Verlag, New York, 2009, p. 921. McClung LS, McCoy E. Genus II. Clostridium Prazmowski 1880. In: Breed RS, Murray EGD, Smith NR (eds), Bergey's Manual of Determinative Bacteriology, Seventh Edition, The Williams and Wilkins Co., Baltimore, 1957, p. 634-693. McClung LS, McCoy E. (1957) Genus II Clostridium Prazmovski 1880. Bergey’s Manual of Determinative Bacteriology. Baltimore: Williams and Wilkins. pp. 634–693. Bergey’s manual of systematic bacteriology: Volume Three: The Firmicutes (2009). 2nd ed. New York, NY: Springer. Mingkun L, Copeland A, Han J. (2011) DUK. Walnut Creek, CA, USA: JGI. Lowe TM, Eddy SR (1997) tRNAscan-SE: a program for improved detection of transfer RNA genes in genomic sequence. Nucleic Acids Res 25: 0955–0964. Stackebrandt E, Rainey FA. (1997) Phylogenic relationships. In: Rood JI, McClane BA, Songer JG, Titball RW, editors. The Clostridia: Molecular Biology and Pathogenesis. New York, NY: Academic Press. p. 533.